But when you’re slurping the hot peppery soup, sweat dripping down your forehead, bumping shoulders with other happy eaters, you’re reminded just how incredibly delicious and soothing it is. 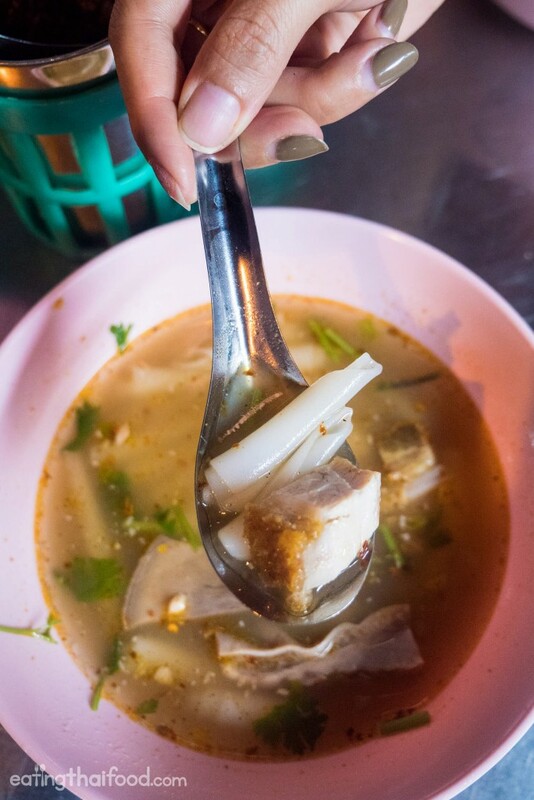 Probably influenced from southern China, kuay jab (ก๋วยจั๊บ) is a Thai dish that includes rolled up wide rice noodles in a very porky and peppery broth, and it’s one of the top Thai street food dishes to try. And when you’re in Bangkok’s Chinatown, Kuay Jab Nay Lek (ร้านก๋วยจั๊บนายเล็ก (อ้วน) is one of the great street food stalls that serves kuay jab(ก๋วยจั๊บ). There are two main types of kuay jab in Bangkok, kuay jab nam sai (ก๋วยจั๊บน้ำใส) and kuay jab nam khon (ก๋วยจั๊บน้ำข้น). 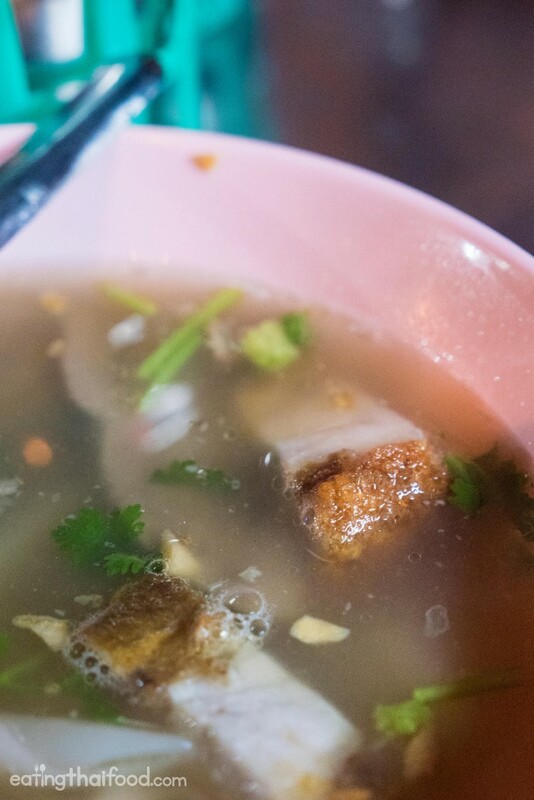 Kuay jab nam sai (ก๋วยจั๊บน้ำใส) is the version of soup that is very common in Yaowarat (Chinatown). 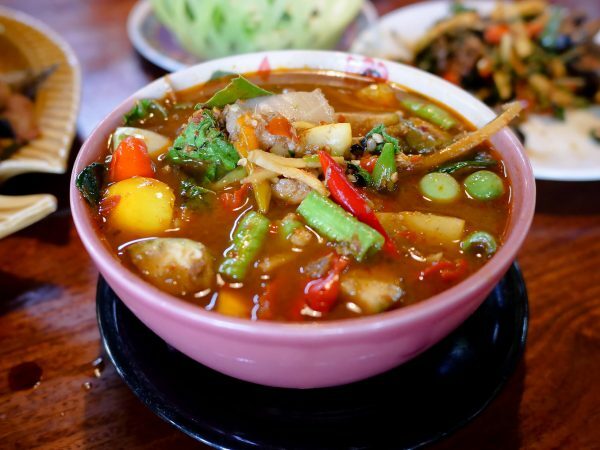 In Thai it means clear soup, and it’s made from pork bones, so it has a strong pork flavor with lots of pepper. Kuay jab nam khon (ก๋วยจั๊บน้ำข้น) is a dark brown, almost black, colored soup broth. The soup has a mild Chinese spice braised flavor to it – including spices like cinnamon and star anise. 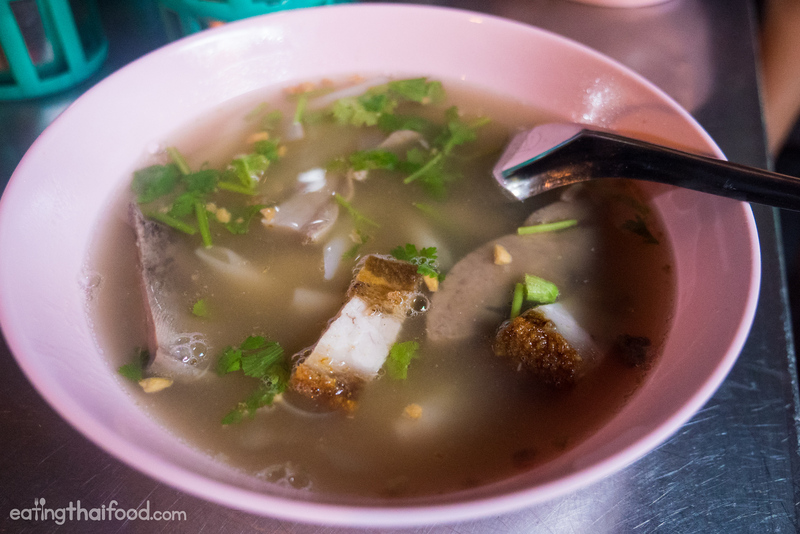 There are big fans of each type of kuay jab, but the popular version to eat in Yaowarat is kuay jab nam sai (ก๋วยจั๊บน้ำใส), and it’s the type I prefer. 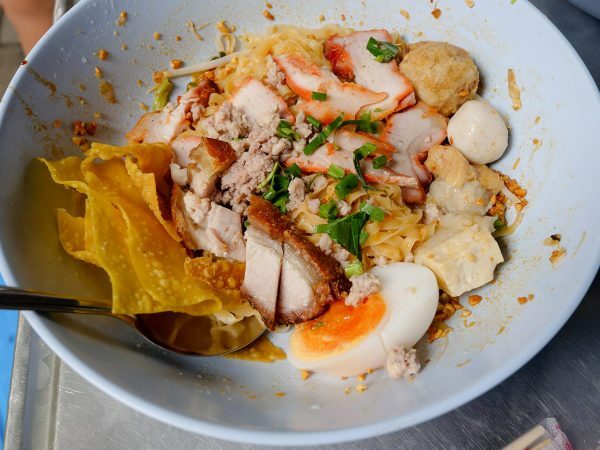 Located along Yaowarat road, and within the lanes of Yaowarat, you’ll find some of the most famous and most delicious bowls of kuay jab (ก๋วยจั๊บ) in all of Bangkok. Another street food stall, Kuay Jab Uan Pochana (ก๋วยจั๊บ อ้วนโภชนา), located outside the old theater along Yaowarat is also extremely popular, and they serve an incredibly good bowl as well. However, lately I’ve really enjoyed the kuay jab from Kuay Jab Nay Lek (ร้านก๋วยจั๊บนายเล็ก (อ้วน), a street food stall that sets up on the corner of Yaowarat Road and Itsara Nuphap (Soi 11). As soon as they open, they will be busy. You don’t have a choice for what type of kuay jab to eat here, they only serve nam sai (น้ำใส). But you do have a choice of what meats to include – if you want everything included, or if you don’t want the organs, and only pork belly. 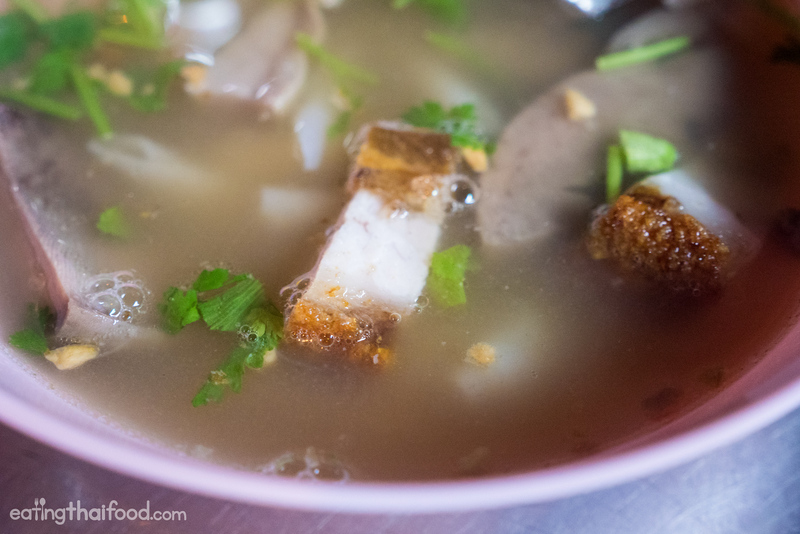 Kuay jab tuk yang (ก๋วยจั๊บทุกอย่าง) – This includes a little bit of everything, heart, tongue, liver, stomache, and finally slices of crispy pork belly with noodles and broth. 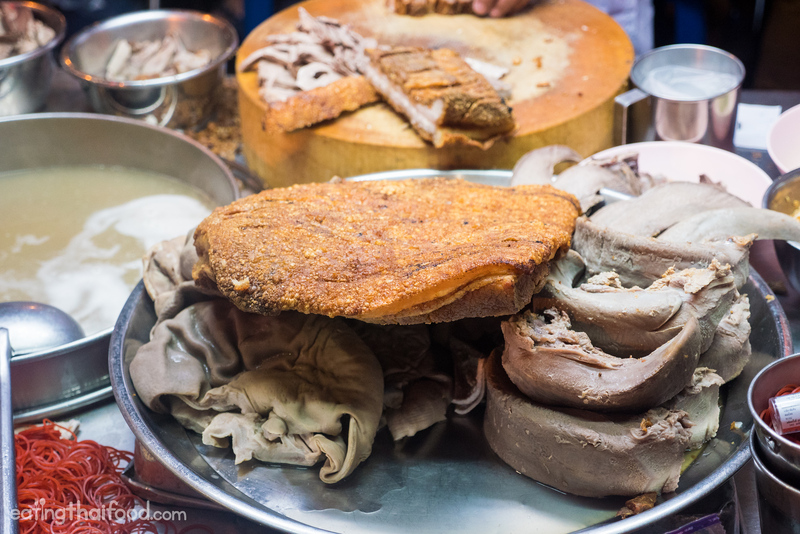 Kuay jab mai ow krueang nai (ก๋วยจั๊บไม่เอาเครื่องใน) – If you order this, you won’t get all the organs, but just slices of crispy pork belly with noodles and broth. If you enjoy organs, I would highly recommend the full option with all the organs. They are cooked so well and they are so soft and tender, you’ll hardly even notice they are organs. For myself, the absolute best thing about eating at Nay Lek (ร้านก๋วยจั๊บนายเล็ก (อ้วน) is the peppery broth. The pepper taste in the soup is strong, but it’s calming and soothing at the same time, and not to mention incredibly addictive as well. I love to eat chili with just about everything, but with a bowl here, I barely even added any extra chili flakes, because the taste of the broth was so superb as it comes. In addition to the broth, one of the things that Kuay Jab Nay Lek (ร้านก๋วยจั๊บนายเล็ก (อ้วน) does so well, are all the bits of the pig. The pork belly was mind-blowing delicious. The edges of the pork belly were fully crispy while the inside was creamy and juicy, and each piece melted in my mouth along with the peppery broth. The organs were also wonderful, each with their own unique texture, yet none of them were chewy or tough, but cooked to tender perfection. The tongue in particular was excellent. Finally, the noodle rolls, which float around somewhere within the soup, were soft and plain, pairing well with the taste of the soup. Although the noodles were good, they are sort of overshadowed by the other delicious floating pieces of meat in the bowl. Kuay Jab Nay Lek (ร้านก๋วยจั๊บนายเล็ก (อ้วน) is one of the many famous street food stalls in Yaowarat (Chinatown Bangkok) that serves kuay jab nam sai (ก๋วยจั๊บน้ำใส), noodle rolls in a clear pork bone soup. What I love so much about the version at Kuay Jab Nay Lek (ร้านก๋วยจั๊บนายเล็ก (อ้วน) is that the broth is intensely peppery and so flavorful that it doesn’t need any extra seasoning. Kuay jab (ก๋วยจั๊บ) to me is not very filling, but more soothing and just tastes amazing, so if you’re in Yaowarat, you could easily eat a full seafood meal, and then have a bowl of kuay jab afterwards. 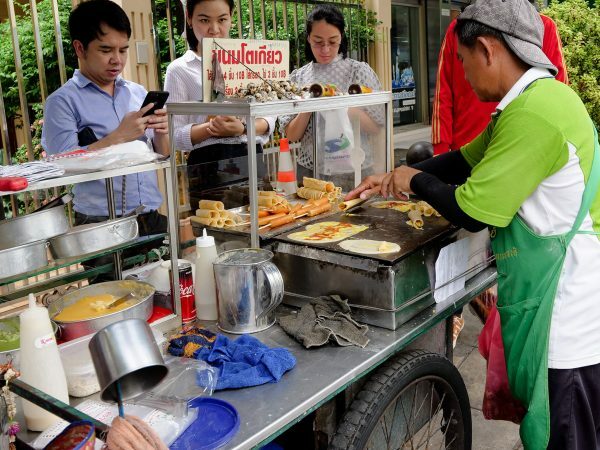 How to get there: The street food stalls opens up at around 6 pm everyday right on the corner of Yaowarat Road and Itsara Nuphap (Soi 11), right along the busy and hectic Yaowarat road. To get to Yaowarat, you can walk from Hua Lamphong MRT station (15 minutes) or you can take a taxi directly there. Hope you’re doing well. I had the chance to eat in Nay Lek during my last trip in Thailand following the recommendations of Thai friends. OMG what an amazing food they do. The moo krop is fabulous, and the pepper broth absolutely perfect. I loved it so much and went back a second time the day after. According to those friends, that’s probably the best moo krop in town, which I agree so far. Any chance you or your wife know where I could find a recipe for kuay jab nam sai broth? Tried like 5 places on Yaowarat, and I’m kind of obsessed haha. I really want to make it this winter in Denver! Hi Sonu, awesome to hear that, glad you enjoy this place! Super yummy. And good video. Thanks. I ate this particular stall on my last stay in Bangkok. I was taken aback by the extremely peppery soup which I didn’t expect. Although it was tasty, it was way too peppery hot for me as it burned my tastebuds to numbness. I’m wondering how this stall compares to the other stall, Kuay Jab Uaan Pochana you wrote about in your eBook. Hey Anthony, thank you for sharing, glad you got to try it. I think they are similar, but if I remember correctly, this one is a bit more peppery, which is why I think overall I would prefer it. But it really depends on how much peppery you enjoy. Enjoyed reading your articles. We’ve been to Thailand three times and I’m ready to go back anytime. We visited the ChinaTown in Bangkok but during the “day”. Had I been aware of the street stalls at night, I would have gone !!! Thank you Doug, glad you enjoy Thailand so much. 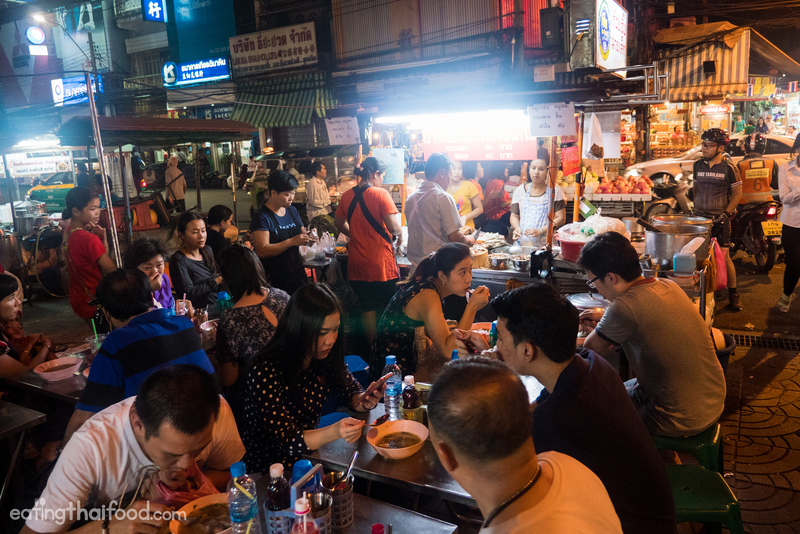 Yah, in the evening, you’ll find an entire different set of street food stalls in Yaowarat. Mark – as a long time reader of your blog and guides, I was excited to see you written up in the Weekend Australian (by John Leathlean). 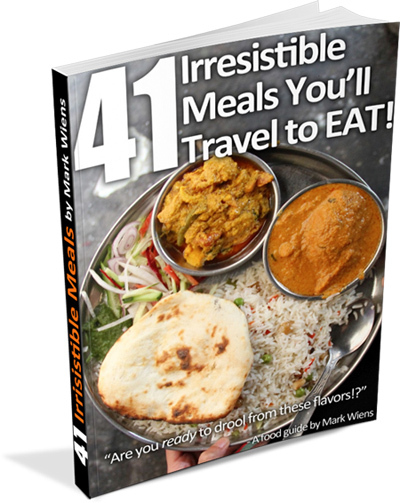 Quite a prominent and lengthy article in the Travel (or Food) section. Well done on that and great to see you getting more exposure. Hopefully we have more people travelling for local food experiences. Hey Stan, thank you very much, really appreciate it. It was really great to have a chance to meet with John. Thank you so much for sharing Kuay Jab. I like it and I grew up with it in Huay Tod, Trang in Thailand. My daughter who is American born went to Thailand a couple of trips and she also loves it. Hi Nui, thank you for reading, glad you enjoy kuay jab as well. Kuay jab is unchanged from its Teochew origins right down to its name. I’m guessing it came to Southeast Asia from the early 20th century wave of immigration from that part of China – now called Guangdong province but specifically, the Teochew part and not Cantonese or Hakka. I don’t know if it’s evolved since in its homeland as have never been to that part of China. I didn’t see it in Xi’an in the Central Plains when I went last summer, where the Teochew originated before they began migrating south 2000 years ago. They do use a lot of vinegar and pickled foodstuffs in that region which is quite Teochew. Hi Tara, thank you for sharing your experience. It would be amazing to visit the Teochew area of Guangdong province to see how much influence there is in so many Thai dishes. This is without doubt one of the jewels of Yaraowat. My wife bought me a bowl of it, along with some Phad Thai from the vendor nearby, and the Kuay Jap was to die for. She warned me it would be very spicy which I took to mean full of chilli, but when the pepper hit me I was over the moon. This is one a many dishes worth getting on a plane for. I had mine with all the organs in it…best way to go. Hey Scott, awesome, totally agree with you, over the moon is a good way to describe the sensation you get when taking a bite of this peppery soup! Hey Vivian, you’re welcome, hope you enjoy it. Hey Wpoh, hope you can come to Bangkok! Thanks for that Mark, didn’t know you could get full pork legs in Bangers! The holly grail for khao moo begins!! Hey Craig, yes definitely at some places, like Charoen Saeng Silom! Hey Des, would the pork broth be alright? 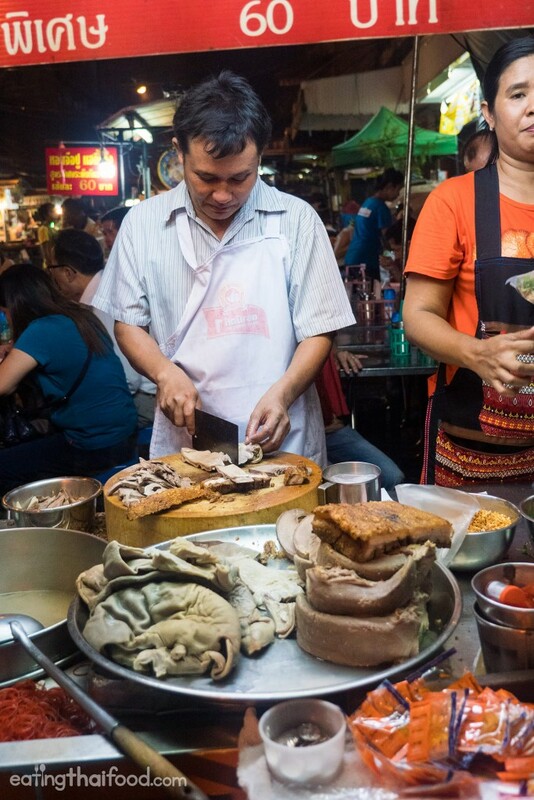 You could try ordering, “kuay jab mai sai neau sat,” which would mean with no meat. Your videos and photos are very awesome :) I love your stories! Thank you very much Anya, really appreciate it. I can’t believe I passed on that place a couple weeks ago, my fixer said it shouldn’t be missed while I was shooting there. Hey Chad, you’ve got to come back for some! Hi Alex, great to hear from you, thank you very much. Alright great, will let you know if I come to Khon Kaen anytime soon. Wonderful – please can I have permission to post your information? Giving you credit without a doubt. Hi Tim, thank you. I don’t really allow any reposting as I don’t want any of my content to be duplicated on the web. What did you have in mind? or what would you like to post? Hi Baz, thanks for the comment and support, and tips. Yah, transliteration is something I think about a lot, and it’s such a difficult subject since there’s no standard. From research I’ve done, the most common form of spelling is kuay jab, but yah it could easily be guay chap as well. But I often think, though the same letter, “gai” sounds like a “G” while “guay”, perhaps due to the vowel that proceeds, sounds more like a “K.” I’m actually not really sure what to do in a situation like this, as it would be a bit too complicated to explain in words, which is why I hope videos can also help, especially for Thai pronunciation. Thanks! Hey Sean, thank you very much, glad you’ll be visiting Bangkok soon! I’ll admit I did not know what to exist after signing up for your $1 Thai Menu, and found a link in my email to this article today, but I can easily say wow! what a wonderfully descript thai food lovers experience! 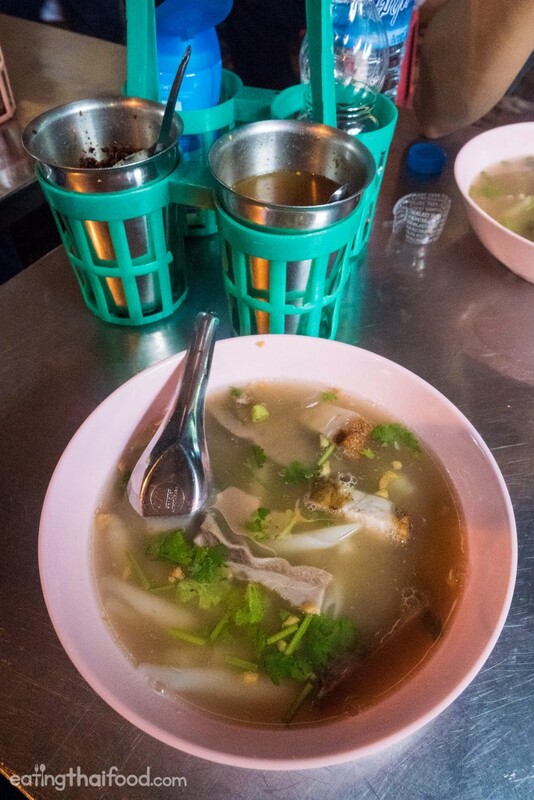 Thank you for your details of location blended neatly with poetic writing of particular enjoyed nuances of the dish – admitting how you skip adding extra chili flakes as the broth is so tasty at Kuay Jab Nay Lek (ร้านก๋วยจั๊บนายเล็ก (อ้วน). I understand that thought process and it speaks volumes to a fellow food/flavor lover. I’m making a trip to Thailand towards the end of April and in my planning of the trip came across your wonderful site! I’m overjoyed by such synchronicity! Hi Michael, really appreciate the kind message, thank you for reading. Great to hear you’ll be coming to Thailand soon, hope you can try kuay jab nam sai when you’re here. Glad we share a passion for spicy and flavorful food! Hey Yi, you’re welcome, thank you for all the great information on your blog as well!